It’s a new year and I don’t do resolutions per se, but I’m making a conscious effort to try to have at least four dinners at home every week. With three kiddos in about a zillion activities, plus church and a few things that Jeff and I volunteer for, our evenings are B-A-N-A-N-A-S (which is, incidentally, what my kids eat for dinner sometimes because we’re so busy). Last week we ate more meals out and in the car than we did at home. In fact, my kids call lunch boxes “dinner buckets” because we use them more for dinner in the car than we do lunch. So, even if we have to eat dinner at 4:45 p.m. (which we did yesterday), we will do it. We will do it so we have a hot meal and we have it together — at a table. Given this goal, I’m all about those meals that can be assembled and baked in one pot. Fewer dishes means a happier mama. I’m especially all about it if the meal is as healthy and delicious as this one. It uses just a teensy bit of smoked sausage to give it great flavor, and that — combined with the ginger, mushrooms, toasted sesame, scallions and soy — make for a real party in your mouth. p.s. I have the butcher cut my chicken for me, so it’s all ready to go when I start this dish. My kids are not mushroom lovers, but you really need them for flavor in this dish. I chopped them pretty small and just said they were chicken. 🙂 Oh, and the smoked sausage is also for flavor. Don’t skip it. Heat the oven to 350°F. Whisk together the soy sauce, sugar, sesame oil, and cornstarch in a medium bowl. Stir in the chicken, scallions, garlic and ginger, and toss so that they are coated with the liquid. Place this mixture in the refrigerator and let marinate for at least 15 minutes while you cook the mushrooms. Add 1 tablespoon oil to the pot, and sauté the rice briefly to develop some toasty flavor (you don’t want to brown the rice here, just sauté it for 1 minute or so), then add the salt and the chicken mixture from the fridge. Pour in the stock. Bring to a boil. Turn off the heat, cover with a lid or with foil and bake for 40-45 minutes. Make sure to taste the rice for doneness before taking it out of the oven. I like my rice a little chewier; some might want it more cooked. Let stand 5 minutes, covered, before serving. 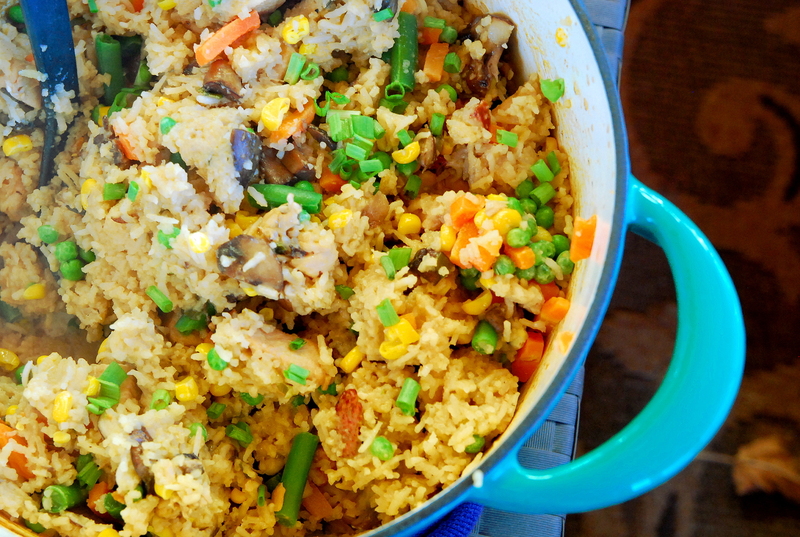 Stir up the rice before serving, as the chicken and mushrooms will have risen to the top during baking. Stir thoroughly so that they are incorporated throughout the rice. Garnish with chopped scallions and serve with extra soy sauce and chili garlic sauce, if desired. Serves 6-8.